There are few worse feelings than that waving goodbye at the airport, but I’m gathering up some happy memories to share with you this week. This was our third, and possibly last, visit to Zoomarine. There’s something so endearing about a dolphin. You’d sacrifice your bath for a week or two if you were offered the loan of one, wouldn’t you? I know I would! It’s great to be surrounded by smiling faces, and the zoo-themed water park has taken a leaf or three from the famous Florida parks, including a ‘catchy’ tune. It’s not something I would recommend for every day as it’s quite a costly business and in full summer would be far too busy for enjoyment. At this time of year, though, the sunshine can be quite warm and the water parks themselves are not yet open, so you can quite effectively kill 2 birds with one stone. But please don’t talk about killing birds around here. They do have ears, you know! 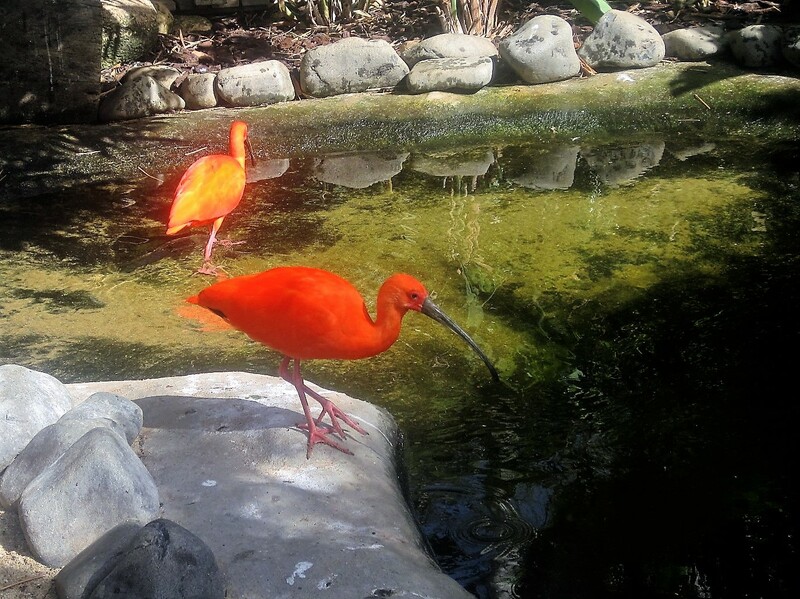 Talking of birds, isn’t this the most wonderful tropical plant ever? 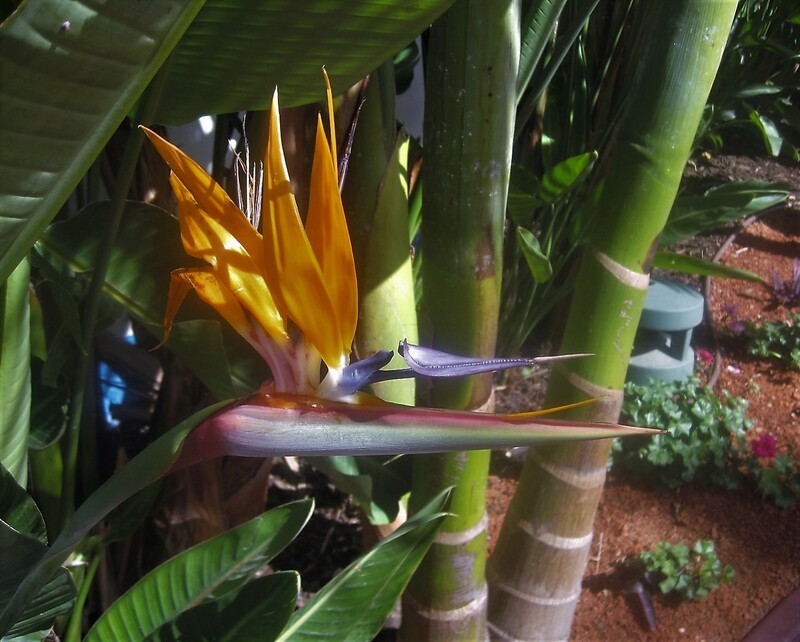 I always have to stop to admire the Bird of Paradise. 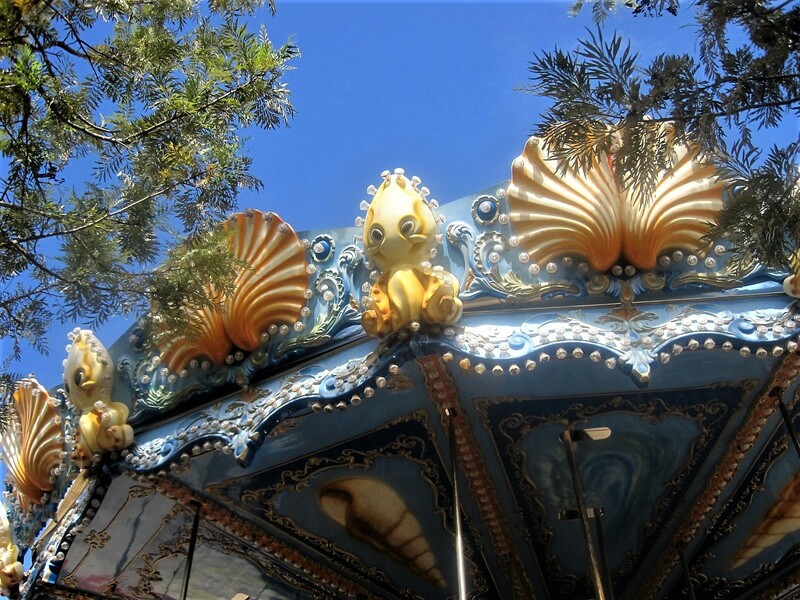 The flora and fauna create a pleasant environment for a stroll, and you can always spice it up with a ride or two. The wave maker was none too rough, but you could whoop your way down the water chute, as mine did. A particular favourite with small person was the rollercoaster. ‘Hands up’ as you swoop downwards. He quite liked being high above the park too. The sea lion show was in the process of being revamped, but there were crazy pirate acrobatics to compensate, and some hefty dinosaurs were being craned into position for a future Jurassic feature. Zoomarine has all the makings of a great family day out. I suspect Patti knew I wouldn’t be able to resist her Delicious post this week. I almost met the lovely lady when she passed through Portugal earlier this month, but it didn’t quite happen. Hopefully another time. She and the Lens-Artists are doing such a good job. And for those of you who care about these things, the one on the right was my choice. Time to catch up with a couple of weeks worth of walks. Please do visit any you’ve missed. And many thanks to all of you for continuing to follow along on Jo’s Monday walk. It’s much appreciated. You’ll be full as a gun when you’re finished over at Jackie’s! Life on the move. Drake knows all about that! Where did Irene get to this week? 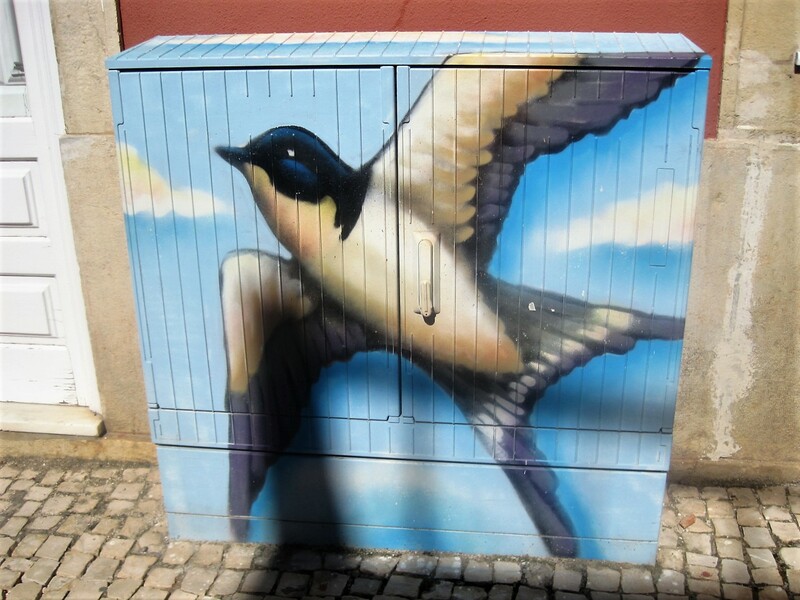 But you could create your own Algarve walk, with a little help from a friend. Many thanks, Becky! It’s Easter next weekend and I hope to share with you some of the magic of this special time of the year here in the Algarve. It would be great if you could join me. Meantime, have a happy and peaceful week! I’ve done and seen some wonderful things down the years, but I never had any thought that I could walk on water! For one thing, I’ve never worn a halo. Water wings would be more useful. 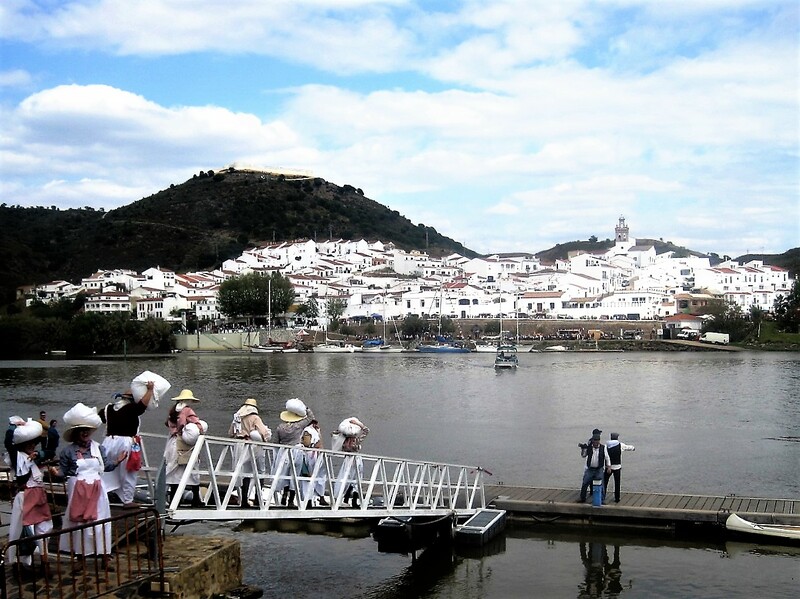 Nevertheless, last Saturday I found myself joining a queue to walk across the River Guadiana- a distance of approximately 720 metres- from Alcoutim, on the Portuguese side, to Sanlucar de Guadiana, in Spain. Alcoutim is normally a sleepy little place and, over on the far shore, the enticing white village of Sanlucar is even quieter. If you have any desire to cross the river, you first have to summon a ferryman, who may or may not be located somewhere near his craft, but will always greet you with a friendly smile. Not so on this occasion. The ‘Festival do Contrabando’ was in full swing and, even as I walked down towards the river, I could hear the hubbub of the crowd. Entertainment was in full swing, with a feisty matador swinging his cape at a ‘burro’ as the band played on, and the crowd cheered as clay pots were hurled through the air and skilfully caught. This was not the Alcoutim I knew! I eased through the crowd to the ‘ticket office’, where I purchased the mandatory bandana, for my admission fee of 1 euro. I joined the queue to cross the river, wondering at what rakish angle I should wear it, and why some were wearing red ones when the vast majority were blue, like mine. Just then the washer ladies arrived, and I was scolded gently and treated to a rub with scented soap. I obviously wasn’t clean enough to join the party. Slowly the queue shuffled forward, controlled by customs officers, of course. The red bandana folk caught the ferry. Maybe they had a pressing engagement in Spain. I followed the washerwomen, laughing and calling out to each other as they flounced ahead. The moment finally arrived and I stepped out onto the pontoon, trying not to look concerned as it wobbled. What a bizarre sensation! The river lapped gently all around me and I rolled slowly with its motion. Gasps and giggles came from my partners in crime, as we staggered towards the middle of the river, not quite believing in what was happening. Fortunately it was a calm day. I think I might have felt a little seasick otherwise. As it was I had assumed the rolling gait of the mariner by the time I reached dry land. And a huge smile split my face. I had walked on water! Over in Sanlucar de Guadiana the antics continued. Flamenco, involving the crowd and a very attractive ram. A good time for all was guaranteed. I wended my way past wondrous craft stalls to a quiet corner where I could survey the scene. A mooch among the stalls and it was time to join the ever growing queue to return to the other side. A few clouds had rolled in and there was talk of storms brewing, but fortunately the weather stayed clear and dry all weekend. One last look back, and I’m home. 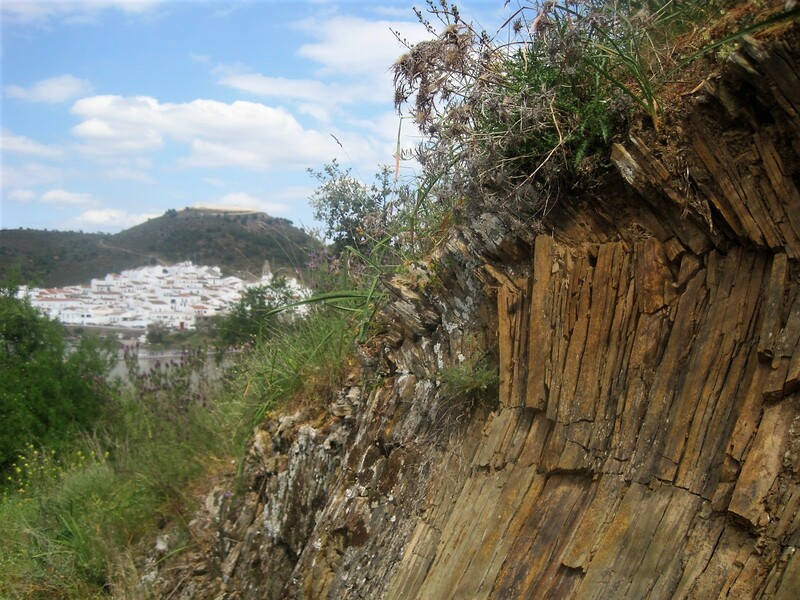 For a fuller account, including the story of the ‘last smuggler’, all of 97 years old, read Becky’s An unusual walk into Spain. That’s it from me, as my son arrives tonight. I’ll be back with a walk on Monday, 15th April. Take good care till then! 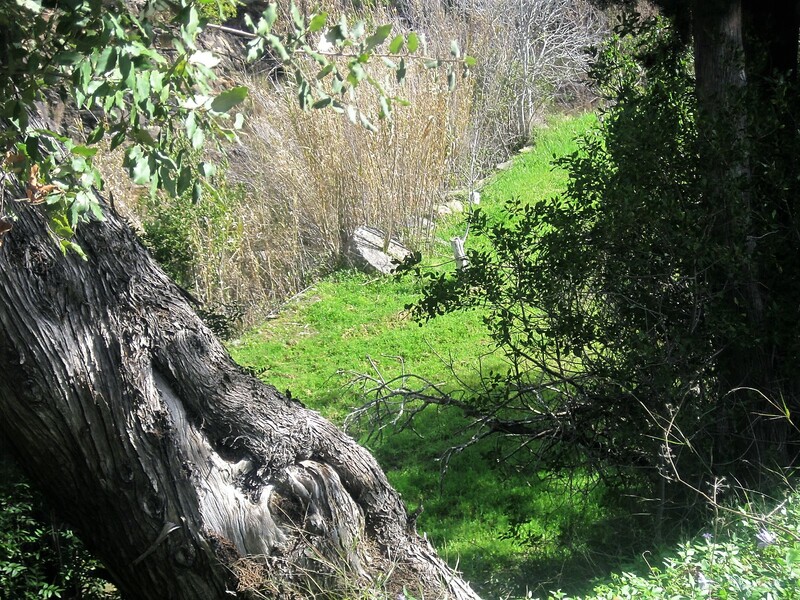 I’m taking you back to Fonte Filipe and the peace of the countryside this week. 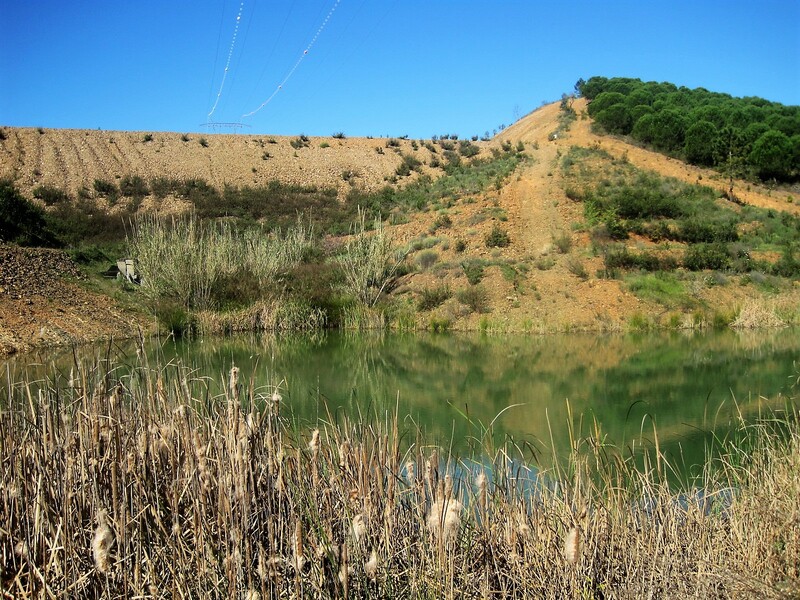 This time we will head towards Querença, a small but lovely village, high in the Algarve hills. I know it best for the Sausage Festival in January, and nearby Fonte de Benemola, a lovely oasis of green. This was a warm day of beautiful skies, and good company. We started out in shade and headed up through the trees, relishing the simple joy of being alive. Almond blossom has dwindled and the nuts are on their way, but in these rolling Algarve seasons there’s always something to admire. If you’re not fond of rust hued farm equipment, maybe a tumble down cottage or two will catch your eye? It’s a great place to indulge your ‘house in the country’ fantasies. With a few, stubborn roses clinging to a weathered wall, and perhaps a shady bench. There are signs and markings to keep you on track, though dilly dawdling as I often do, it’s easy to get left behind. Usually we’ll have a back marker, or good shepherd, tasked with keeping the flock together. Today I’m transfixed by the cloud patterns overhead. Just lately there have been very few of these loiterers, tracing patterns in the blue. Gnarled trees snag my attention too. It’s no wonder I so often get left behind. Passing through a tiny hamlet, I’m further distracted by the harvesting of carobs. The farm hand is only too happy to pause in his labours to smile and give a thumbs up. We’re not far from Querença now. At the heart of the village lies a magnificent square, the church looming over it protectively. It’s a fine spot for a coffee, but the leaning pines suggest that you might sometimes need to huddle indoors. It’s high and exposed here, the chapel nestled quietly, further down the hill. Just past the chapel, if you keep your eyes peeled, you’ll find a little turn off signed Beco dos Faiscas. This leads down a lovely old cobbled path, beneath shady trees. Just around a bend, something that looks like a small seat- what my mother would have called a ‘cracket’- to sit a spell. A well maintained flagged path leads through the valley. Beside some rushes, an abandoned mill wheel hints at former occupation. A ‘for sale’ sign adorns an ornately topped post, and then the mill house appears, behind a hedge of extravagant crimson. All too soon the walk is over, and you’re back at Fonte Filipe, no doubt wondering what’s to eat. Can I tempt you with the ‘arroz doce’? There are other choices, of course, but we’ll save them for another day. Hope you enjoyed the walk! Just a word of warning! I won’t be posting Jo’s Monday walk next week, but I’ll share any walks that arrive in the meantime the following week. Meanwhile, please do read and enjoy these. Cheryl’s Skywalk takes walking to a whole new level. You’ll love it! Did you visit Delphi, with Debbie? It looks phenomenal! Not everyone is so lucky with the weather, as Jackie will tell you! A little grey in Denmark too, but there’s no place like home, is there, Drake? Can you ever have too many Camellias? Share a little romance with Carol? Becky’s beaten me to it with this one! I never thought I’d get to walk on water, but I did! I hope to post my take on the Smuggler’s Festival later this week, but I won’t be walking with you next Monday. My son and partner are arriving soon, with a lively 6 year old, and I suspect I’ll have my hands full. I’ll be back with a walk in 2 weeks time. Take care till then! Are you out of spikes yet? It’s getting perilously close to the end of March, and you know what that means? No more Spiky Squares 😦 (and Becky can have a rest 🙂 ). The good news is, Six Word Saturday continues. Yabba Dabba Doo! Have a great weekend! 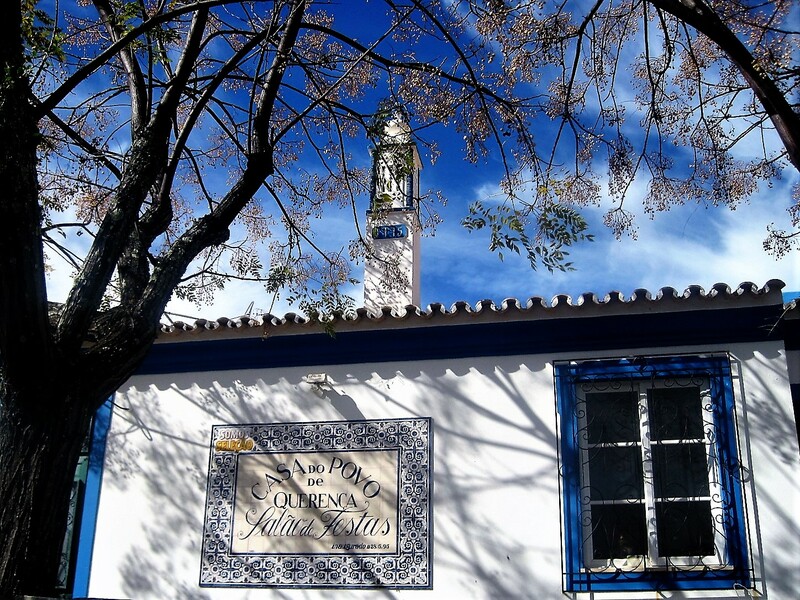 Silves, as one of the loveliest towns in the Algarve and its former capital, is one I seldom fail to take visitors to. Last weekend, while strolling the streets on my way to a Mediterranean Garden Fair, I was much taken with some distinctive and amusing street art. Boxes housing electricity cables are seldom an attractive feature, so an initiative to transform them must surely be a good thing. ‘Stencilpes’ is described as an urban intervention project to encourage young people’s interest in art, using images from history, architecture and nature. I could find little information about the individual artists, but I thoroughly enjoyed spotting the artworks. Whimsical creatures rub shoulders with cork oaks and olives, grapes and strawberries, birds and butterflies. 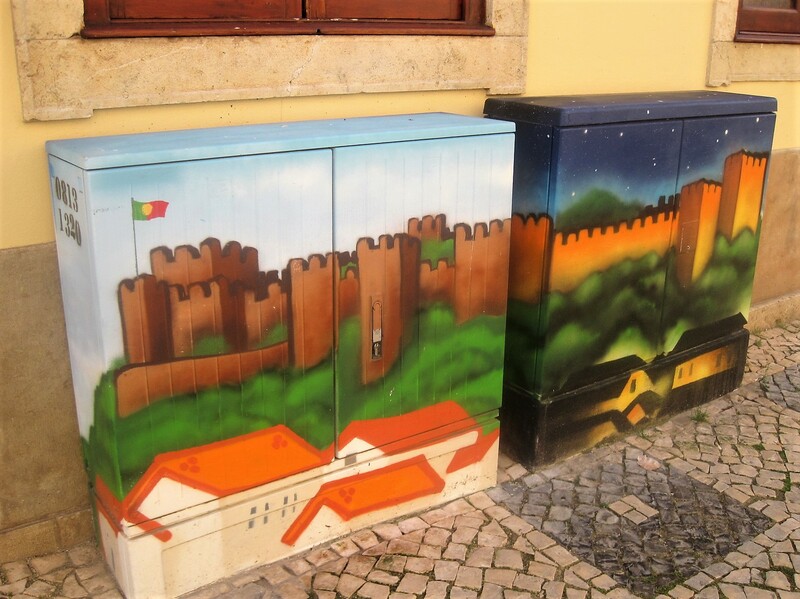 On the riverfront, these pieces of modern art pay tribute to Silves’ Moorish past. High on the hill, the red brick fortress looks down on peaceful streets. The morning market supplies restaurants and locals alike, but then the town seems to sleep, leaving just the storks to keep watch from their lofty perch. Great, aren’t they? No need for me to say much! A nice change for you. I found myself wandering into an area I didn’t really know, in pursuit of the boxes. On the corner of Rua Dom Afonso III stands a pretty little church, Igreja Nossa Senhora dos Martires, and a statue of the martyrs, which looks like it’s seen better days. I don’t know about you, but I was starting to feel the need for some refreshment. You’ve been very patient this week, so I’ll give you a choice. While I was eating, a clattering noise overhead caused me to look up. What a magical sight met my eyes! A stork was descending to his waiting mate, on their nest above. I averted my eyes, politely, from their noisy love making. The garden fair wasn’t the highlight of my afternoon, but I did buy a couple of plants and a terracotta pot. I wandered back to the riverside parking, a big smile on my face. And spotted another couple of boxes! I’m sure I’ve missed a few, but maybe next time? I hope you enjoyed them too. 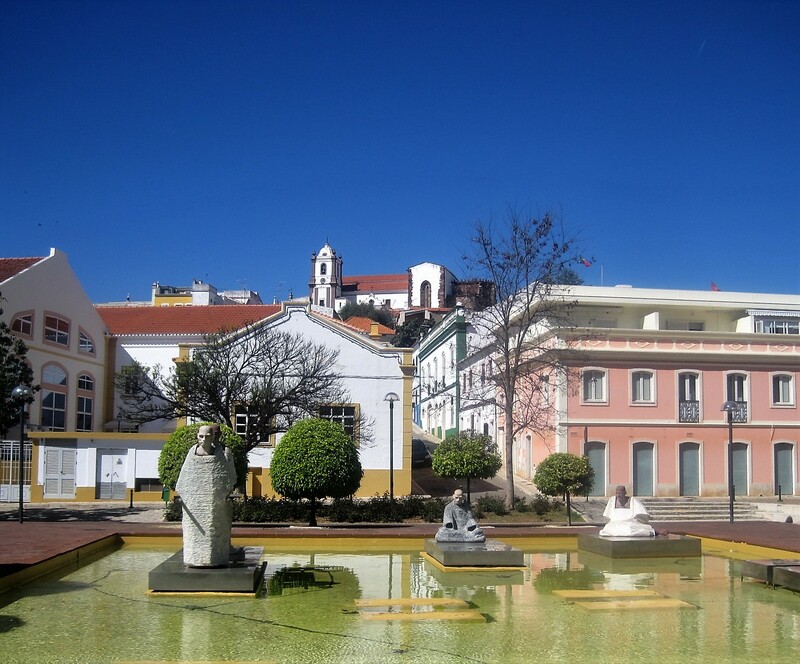 S is for Silves will give you a little background on the city. Thanks so much for your company on my little jaunt! Join me any time you can, here on Jo’s Monday walk. You’ll always get a warm welcome. A rainy day in Paris? Don’t despair- just follow Jude’s lead! It’s all a bit weird and wonderful at Drake’s place this week! Follow Ulli to Germany- it’s beautiful too! Covering up the weariness with a smile; you must be following Cathy’s epic journey? There’s a regular Monday meetup over at Sami’s Colourful World for all those of you who love street art. Have a great week, and see you next time! One for Jude to identify? ‘Some are Spiky, some are not’. 🙂 Share Six Words with Debbie, and don’t forget to find a Spiky Square or two for Becky. Have a great weekend! All that Carnaval razzamataz put away for another year, it’s back to the quiet life this week, in my sunny Algarve hills. North of São Brás de Alportel lies a beautiful, green area which has provided me with many walks. Twice lately I’ve started out from Fonte Filipe, a natural spring in the shape of a lemon, where legend has it a young girl appears at sunset, washing and singing in the fountain. 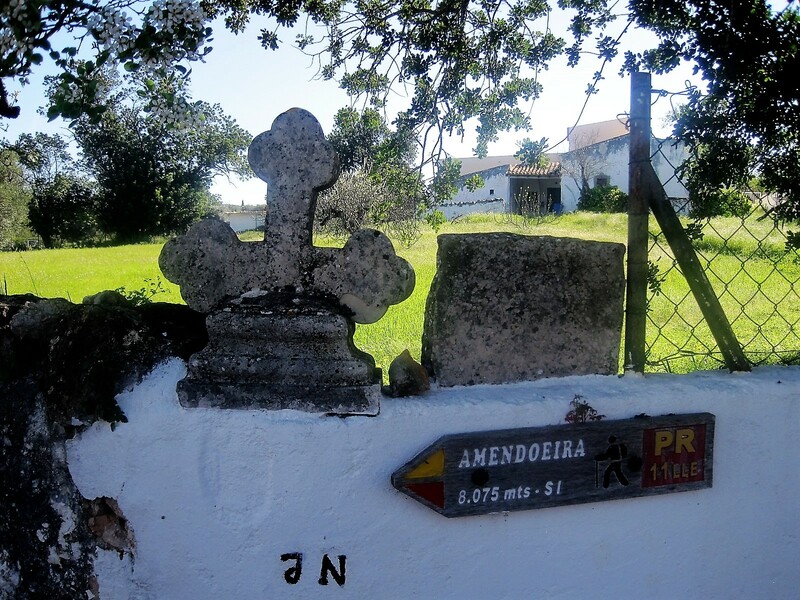 Leaving the fonte, I follow signs for Amendoeira. Through the frothy wisps of tree branches, gentle humps hint at the surrounding hills. A steady climb brings you to a villa, and a dog who looks down with casual indifference, lord and master of his landscape, for today, at least. 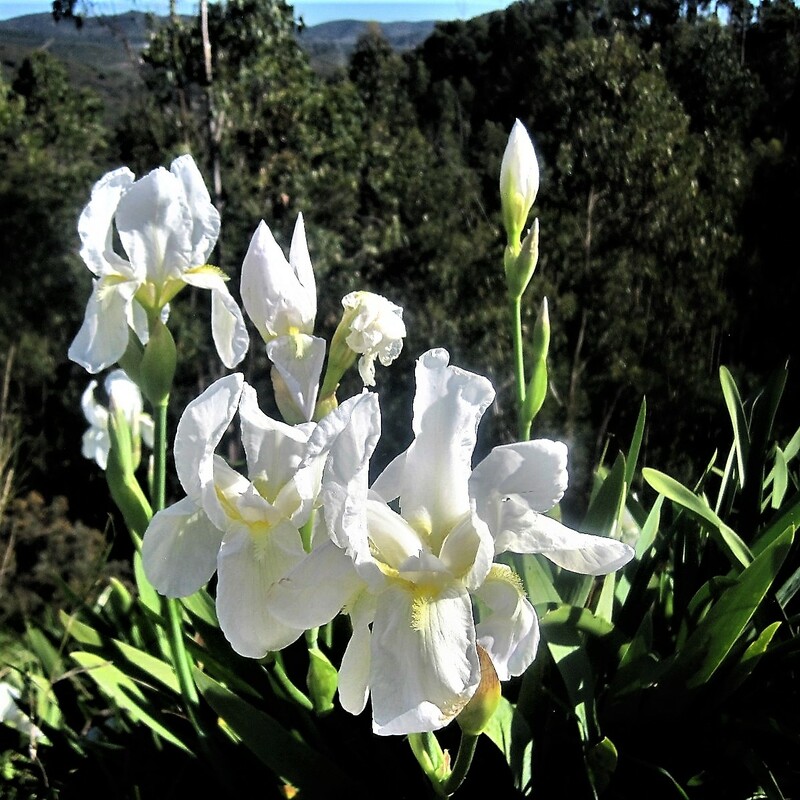 A drift of wild iris illuminates the path ahead. Water is always the highlight of a walk for me. I peer into ponds, ensnared by the meekest weeds, while reeds as straight as guardsmen protect me from the chorus of frogs. Beyond them, cistus dance gaily in the slightest breeze. 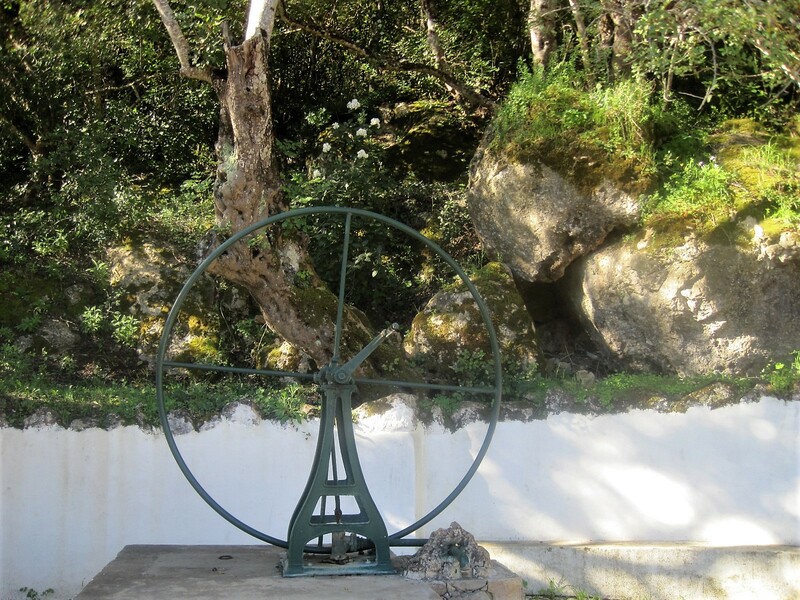 Natural springs supplied the local populations of Amendoeira, Resinas, Carvalhal and part of São Romão, and were used to irrigate the crops. Stone pines grow freely here, their cones effervescent with colour at this time of year. Mounds of cork lie drying in the sun. It’s the turn of the pink cistus to dazzle now, the bees humming in ecstasy, while the wild narcissus gently nods. Not to be outdone, there’s a flourish of cream and yellow among the rocks. Back on the valley floor, a trickle of stream slides past the stepping stones. I could paddle deliciously, but prefer to test my balance, pausing to enjoy the cool and the entwining of the shadows. The trail from here is flagged, making easy walking. 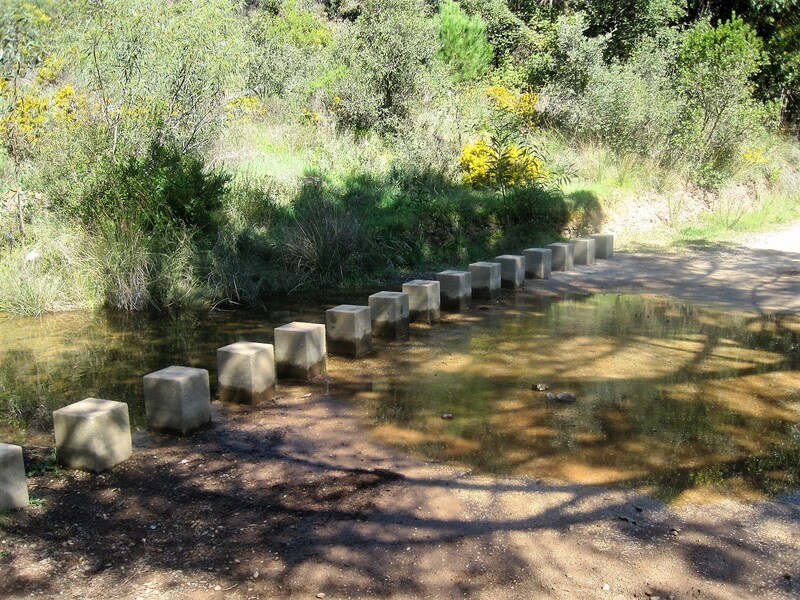 It’s part of the Via Algarviana, which crosses the Algarve from the sea at Sagres to its border with Spain. You need to keep your eyes wide open, for some jewels hide their beauty in the shade. The bee eater orchid can be a shy creature. Back into the sunshine, I pass a mill race, on the home straight now. One more flurry of beauty and I’m back where I started. From Fonte Filipe it’s an easy drive down into São Romão. I stop to purchase homemade honey from a café, and a favourite restaurant, with views over the valley, supplies a wonderful panna cotta. Bombarded with walks this week, so you’re going to need to spend a little time here. There are some beauties so please do visit if you can. I just can’t believe I’m still sharing snowy walks! Who’d be Canadian, Natalie? I don’t mind a spot of rain sometimes, if we’re going somewhere interesting. Thanks, Susanne! Why not take it slow, and just enjoy the beauty, with Rupali? Short but sweet, and very familiar, from Becky! Did you spot my Spiky Squares to welcome her back? There’s nothing like looking at beauty through the eyes of one who appreciates it. Double helping from Jude! Hope you enjoyed my company this week. I certainly enjoyed yours. Take care, and catch you next time on Jo’s Monday walk!